A limited number of these buttons will be available at the Monday night Symposium. If you have something to share about the most important issues of the 2nd half of the first term of President Donald Trump we still have eight seats open at the “Keep America Great Symposium” this Monday at the Marriott Courtyard Tysons Corner, 7 to 9 PM. We have room for 20 individuals and encourage every one present to speak for a minimum of 1 minute on up to 10 minutes each (cleared in advance please if you want 5 minutes or more). While everyone gets at least 1 minute at the “Lightning Round” at the end, the conference does require an advance RSVP and confirmation for admission to make certain we have space for those who wish to attend. The “Keep America Great” Symposium – which is free – is seeking those who have been most actively involved in the conservative cause to participate in planning and discussing the issues that should be our priority in the year ahead. At the time of this announcement, there are now 12 of the 20 seats filled, leaving 8 open seats, including the priority seating for up to one additional Gold Host and several Silver Host who may wish to step forward (visit the Eventbrite Registration Page for details and benefits). “Keep America Great” is the new slogan for Trump supporters after the Nov. 6 mid term election and bright red hats with that slogan will be on display at Monday’s Symposium along with their signature, bright red, TrumpYes.org button. The leadership of Americans for the Trump Agenda will meet the next morning to review the discussions and proposals of the evening before and try to choose projects to test for financial and activist support. If you have strong views in support of President Trump and you want to help Keep America Great, we strongly urge you to make your application to participate in this very limited attendance Symposium. Written papers to be delivered, either to supplement oral remarks or as a copy of such remarks, are especially welcome, and those who provide us a topic and a commitment to make such remarks will be given first priority to speak in the limited, two hours long Symposium. There is a suggested $5 donation at the door, although Americans for the Trump Agenda will only have a very small part of the total Symposium expenses collected from such small and optional donations. In order to indicate your interest in participating, or to provide financial support for the Symposium, you may go to the Eventbrite page HERE or write EventCoordinator@FreedomLeadershipConference.org. Please be sure to provide your phone number so we can contact you to confirm your attendance if we have space for you as one of the 20 Symposium participants. 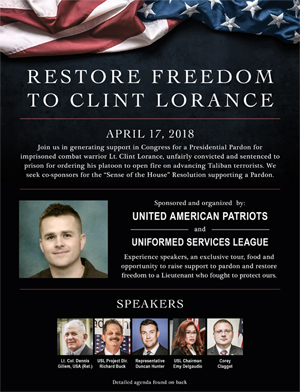 Confirmed speakers at this announcement are: Fredy Burgos, Project Director of Americans for the Trump Agenda; Sant Gupta, also serving as Master of Ceremonies, Richard Buck, the Freedom Leadership Conference Event Coordinator and Project Director for Uniformed Services League, Jon Moseley, a founding member of the Leadership of the Freedom Leadership Conference; Kevin Peterson, a member of the FLC Leadership, and Emy Delgaudio, Conference Chairman. Americans for the Trump Agenda and Freedom Leadership Conference reserve the right to choose which comments recorded at the conference will be used to help promote the conservative agenda on their website and their youtube channel. All speakers consent to being recorded for this purpose unless they clearly indicate their preference to wait for an open spot after all other speakers have made their own presentation first.